Questions About Natura and Pure Bliss Latex Pillows. Home → Mattress Protectors → Danican Waterproof Mattress Protector → Questions About Natura and Pure Bliss Latex Pillows. I’m interested in some of your pillows and have a couple of questions. 1) What is the size of the Queen Pure Bliss Talalay Latex pillow? 2) For a toddler pillow, I see you recommend the Natura Kidz Pillow. Where is the wool located? I’d like to get a standard size pillow so it fits with all my standard pillow cases. 1) The Pure Bliss Talalay Latex Pillow measures, 26” x 14” x 7”, in queen size. 2) In the Natura Kidz Pillow, The wool is just behind the cotton cover. Kidz Sunshine Pillow Lull your child to dreamland with the soft, supple comfort of a Sunshine Pillow. 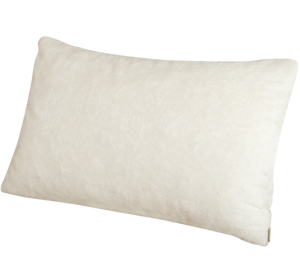 A hypoallergenic, alternative to a feather pillow, you’ll rest easy too.